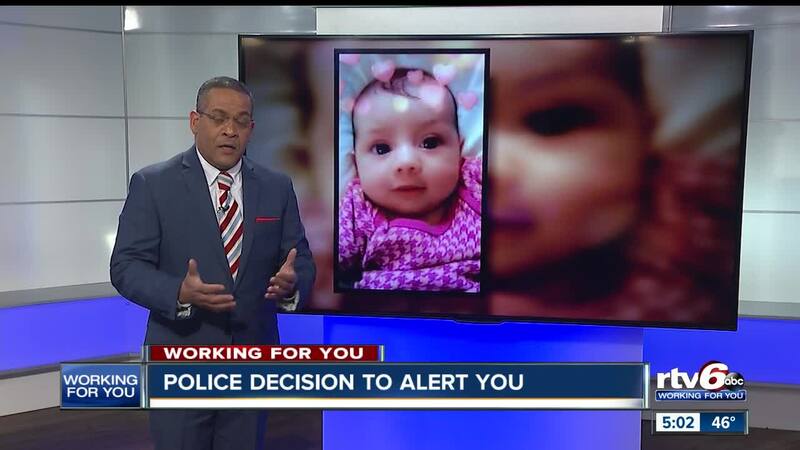 INDIANAPOLIS — An Indianapolis infant is still missing and police are asking for the public's help to find her, but the big question on most people's minds is why was a Silver Alert issued for the 8-month-old instead of an Amber Alert? Amiah Robertson's mother told police she last saw her child on Thursday, March 14. Police took a missing persons report from the mother on Saturday, March 16 and a Statewide Silver Alert was issued by Indiana State Police on Tuesday, March 19. So why not an Amber Alert? Amber Alerts are generally activated for kids who have been abducted or who are in danger and only if police have detailed information about a suspect. Those Amber Alerts trigger a massive response, including text messages, a message on the INDOT highway boards, social media and an announcement on television and other media channels. What's different about a Silver Alert? Silver Alerts were previously only issued for "vulnerable adults" who were believed to be in danger, but a 2018 law expanded the Silver Alert program to include "missing endangered children" which means any child who is believed to be incapable of returning home without assistance because of mental illness, intellectual disability or another physical or mental disability. Silver Alerts get a news release, social media and media attention. Law enforcement only use the Amber Alert in the most extreme cases, because they don't want people to ignore the alerts when they are issued. Since 2015 there have been 39 requests for Amber Alerts in Indiana, only 20 of them have met the criteria. In that same time frame there have been 255 requests for a Silver Alert, with 182 of them meeting the criteria to issue one.